Mindtamer is a program that has been my life in recent years. In particular the last 6 years since 2007. I have turned my life around from having a life of uncertainty and heading towards a bleak future to now living the life I want to live and heading towards greatness. You can read the whole story about how my life turned and the details here. But the short version is I take you through a new Module each month. Each module contains certain lessons where I teach you in either video, audio, or written format (usually all 3). The lessons are the things that I have implemented into my life with huge success. You get all the good stuff from me, I already made the mistakes and improved upon them. So think of them as the cliff notes to life success. The nutritional module opens up right away for you as well as Module #1- A Fresh Start. This is because what you eat and drink will make the most impact on your ability to learn and apply the lessons I show you in each Module. 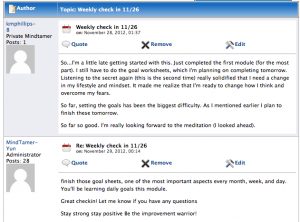 Mindtamer is a self-paced program. New modules open up for you every 30-days. But some people take 45 days to finish a module, some take 60, some take 90. It is up to you. But remember for it to work you have to work it. It is vital that you set a routine and schedule for the Mindtamer program. Because the lessons in it are life lessons created to improve your life in all aspects- work, family, body, health, mind, social, etc….. There is no pressure to get through the modules as fast as you can. Some lessons will be harder for you to implement then others, so be patient. The modules and lessons will always be there for you to go through and go back through to review. There is a detailed checklist on each module so you can check off your progress as you go through it. How are the lessons and modules taught? The modules are broken down into lessons. The number of lessons varies from Module to Module. The nutrition module will have the most lessons in it, as I am always trying to add to it, as I am constantly learning and studying nutrition. The lessons are usually recorded first via video. Then they are simply turned into an .mp3 for audio download or listening directly from the website. Then they are transcribed into a written .PDF. Different people learn different ways, which is the reason for the 3 styles. It is also helpful to go through each style to ‘burn’ the content into your subconscious and make it a habit quicker. Other things like the guided meditations and visualizations are simply a recorded audio, where you can either listen to it via the website or download it onto your phone or iPod. Warrior yoga sessions are recorded via video and you simply follow along at home. We recommend learning the poses and movements so you can create your own routines. There really is no set way to perform warrior yoga. There are separate videos for each new pose, flow, and movement. There are no strength or flexibility requirements for warrior yoga. No you do not. I do not talk at all about religion in this program. You can be spiritual without being religious. We are all spiritual beings. We will introduce you to several practices including meditation, visualization, warrior yoga, breathing techniques and more. All these spiritual practices will help to become more spiritual, more relaxed, and help to find out your true passion in this life. First and foremost we expect you to be accountable to yourself. You matter. You can make a difference in the world and the people around you, but you have to be able to be accountable and motivate yourself. It’s good to have external motivation as well, but if you really are not driven to become the strongest version of you and become the Improvement Warrior everyday in the long-term it isn’t going to work. We are not after short-term change. With that said we have a forum that you can post any questions you have about the program, lessons, etc…. There is also a section where you can checkin weekly with your progress– your wins, stumbles (there is no failure with Mindtamer unless you quit), and any questions you have. What if I need extra accountability? 2. I also offer a platinum Mindtamer membership option, which gives you unlimited email access to me, a bi-weekly conference call, and individual coaching. This is not listed on the regular sign-up page. The cost is $249 a month. If you are interested please fill out the consultation form and email me that you are interested in the Platinum Mindtamer Membership. Possibly. Online coaching. I’m simply showing the ways and things that I have done to change my life. I don’t consider myself a life coach. I started in the fitness and nutrition arena. With good solid foundations in those two aspects I believe anything and all is possible and enhanced. I simply believe that I have experiences that other people can use to enhance their life. Mission statement- We (Yun Strength and Fitness Systems Corp) will help directly 3,000,003 people change their lives by 2023. We will do this with our services and products that help to transform people’s lives in terms of fitness, nutrition, emotional, mental, and spiritual health. The education and daily practices that we help to provide will last a lifetime for those that chose to change. The total number of lives touched will be well over 10,000,000 this will be the result of the 3,000,003 people that we have helped directly that have changed their lives will help to change the lives of others- family, friends, clients. I have dedicated my life to helping people get better. Get in better shape, fix their nutrition, fix their health, change their lives. I have gone through some dark times in my life and I arose stronger then ever and with the passion to help people create the life they want to live. Again, here is my my story and how mind tamer came to be. I am truly sincere about what I do, I love doing it, and my hope is it comes through in all the videos and blog posts and copy on this site. Am I the foremost expert in life– NO. But I am living it everyday, and I practice what I preach. And I strive to be the Improvement Warrior everyday. It’s completely up to you to make the desicion to join Mindtamer. But that is why we offer the $1 14-day trial to you. Yes. I hired a business coach in 2009 that I am still with today. In 2011 I joined a Mastermind group. In 2012 I hired a mental toughness coach who I plan to stick with forever. In 2013 I hired a meditation/yoga coach. In 2013 I started another mini-mastermind group with 3 guys in it, the other one has about 20 people in it. Plus I am constantly investing in programs and certifications and books and membership sites that can help me reach a new level. I truly believe that everybody needs some type of coaching. Coaches help you get better. There are coaches for everything in life— from sports, to life, to business, to family, to marriage, to nutrition, to personal training, and the list goes on and on. I know I would not be where I am today or headed to where I am going without coaching. It just makes you better. Period! I'm pretty successful with my life, will this program benefit me still? There is always room for improvement. Even if you are the best at what you do you cannot get com placement, because there is always someone behind you trying to catch up and knock you off your pedestal. These lessons are all about gaining complete control over everything in your life. Mastery of self, life, and circumstance is what Mindtamer is all about. I have issues completing things I start or sticking to my goals. Will this help? Yes. One of the 3 biggest things in the entire program is goal setting. Not just setting them, but setting them up right. So you follow through with and you see yourself achieving them. People that don’t set goals do not achieve success. It is proven time and time again. They may get lucky once in a blue moon but they can never sustain that level of success. Successful people set goals. They know what they want and go after it. There will be times when they stumble, but goal setters always get back up, re-assess and then go right back after it. And once they reach those goals, they set new ones. Higher goals. Loftier goals. Worthier goals. Because it isn’t so much about achieving the goal as it is the journey to get their. Going after your goals makes you happy. Happy right now in the moment. I will show you the way to become a goal striving machine. I'm not currently working out or I have an injury right now. That is ok. Starting in module 1 we simply work you up in a very simple progression. You will start off with just very basic exercise and work up from there. If you are injured same thing applies. If all you can do is walk, that is what you will do. If you have a lower body injury, you will train the upper body in a systematic approach and vice versa. The physical training we put #1 as the 6 Positive Strengths, because I know the power of being fit and in shape and having a healthy body can do for a person mentally, emotionally…. But it has to start. Just like any other thing in your life. DOn’t worry, a lot of people’s nutrition is not good. As soon as you join mindtamer you will have access to our Nutrition Module. This module will inform you of a lot of vital information that you will need to change your diet. Not just telling you what to do, but also educating you. Because it is important for you to know why you are doing something. There are a lot of lies out there with food and nutrition, I’m going to help bring you all the truths and turn you onto to several different lifestyle plans for nutrition. Never again will you need to ‘go on a diet’. I have a lot of negativity energy in me. How will Mindtamer help me? Yes. This is what we set out from the start to do. There is power in positivity. Your power gets drained with negative thoughts and emotions. We show you several techniques to get your thoughts over to the side of positivity. For each person the time to do so will depend on a lot of factors, including, nutrition, workouts, family, career, habits, environment, friends, etc….. But once we tip the scale in favor of positivity it is like a roller coaster once it’s gone over the initial drop– it doesn’t stop. Life gets dramatically better and fast. So I'm going to become you? The program is based on things you did? The things I did in my life are universal success principles. It is not something that I made up. 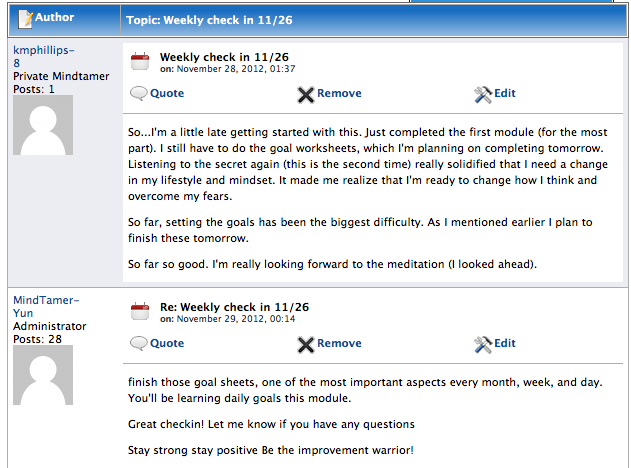 I just took ideas and turned them into things I could use to help me in my process of becoming the Improvement Warrior. I use what is useful for me and discard what is not. Different things work for different people. But things I’ve learned from Napoleon Hill, Tony Robbins, Seth Godin, Deepak Chopra, Oprah, my own coaches, and many many others have been incorporated into my life. Not everything works for everybody. The stuff I introduce you to in Mindtamer might not work for you. But something out there will. And it is up to you to find it. Because if you don’t work on improving yourself you are getting worse, and your life will remain the same. You always need to be investing in yourself. You put in the time to become a better person and the results will come. If you just put in the time eating bad foods, watching tv, playing video games, engaging in bad habits, etc……. then things will stay the same, or eventually get worse. This is why we offer the 14-day $1 trial. You can go through a lot of the first module and nutrition module in that time and tell if this is something you are ready for. Like I said these are universal success principles and the first module is the most basic, so if you are not willing to do the ‘basics’ of life betterment then this program is not for you. And there really won’t be any ‘life changing program’ that is right for you. Until you are fully ready. Whenever I try to change for the better, people in my life make fun of me and bring me down. What should I do? People that don’t support others in their quest to become a better person need to be let go of. Or you need to severely reduce the amount of time you hang around them. Because that is negative energy. And anytime you are around negative energy you yourself will be wrapped up in that energy. If the person is harder to let go of, or you are ‘required’ to be around that person, like when it is a spouse or family member, let them know your intentions. There will be negative feedback from them, they are happy being themselves and they can’t really see nor understand why you are trying to change for the better. So you need to lay out some expectations for them. People will tell others they can’t do it, because they can’t or are afraid to do it themselves. Don’t ever let others tell you what you can and cannot do. They are not you, they do not have your passion to change YOUR life. 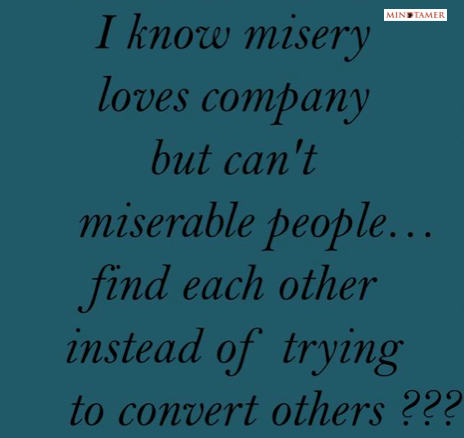 Misery loves company, so you need to figure out a way to avoid misery all together, or severely reduce the time you spend around it. What else is coming in the future with Mindtamer?